The e-book is now available for International sales in the English language. 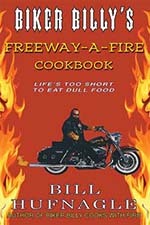 Biker Billy is proud to announce that Biker Billy’s Freeway-a-Fire Cookbook is available again in a new Paperback First Edition. The second book in the Biker Billy cookbook collection has been out-of-print for several years. First edition copies will sellout quickly so order yours today! You are also invited to join me on Google+, Facebook and Twitter and the"Biker Billy Cooks with Fire" You Tube Channel! I am posting new content as my schedule allows so check out the social media and please tell your friends. If you are producing an event in 2017-2018 and would like to feature Biker Billy's fiery cooking shows as part of your entertainment, just send an email to: and please mention "event booking" in the subject line. Events are posted to the site as the dates and details are confirmed. 2017 will be an exciting and busy year for Biker Billy with some exciting book publishing news to be announced soon. 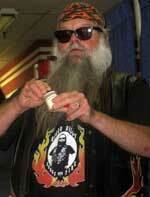 You can read "Biker Billy's Irons in the Fire" Blog., which is a part of the site. 2015-2016 were a fiery years with the Dairyland collaboration. Along with the continued success of both his fourth book "Biker Billy's Roadhouse Cookbook" and the third book "Biker Billy's Hog Wild On a Harley Cookbook" along with the paperback version of his best selling original book "Biker Billy Cooks with Fire". So check the site often for more information on where you can see Biker Billy cooking and autographing his books. See where Biker Billy has appeared during 2003-2016. 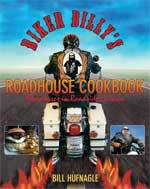 Biker Billy's fourth cookbook is available online and in bookstores. This book is dedicated to great American Roadhouses, diners, burger joints, truck stops and the venerable drive-in; their recipes and the history of the American road. © COPYRIGHT 1998 - 2017 Biker Billy & Alright Productions, Inc.